Ibn al-Khattab, or Emir Khattab, is one of several possible identities of The Emir mentioned in Rhea's Confession. 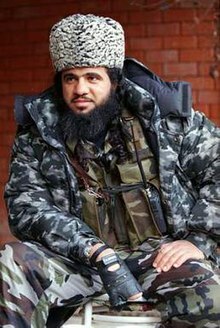 Khattab was a Chechen rebel leader until his death in March 2002. Alongside Shamil Basayev, he led the Invasion of Dagestan in 1999, triggering the Second Chechen War. He and Basayev were accused by the Russian FSB of masterminding the Russian Apartment Bombings1 of September 2009. Khattab was assassinated by the Russian FSB, who poisoned him with a letter containing a sarin-like nerve agent. 1. This event is potentially very relevant, and is worth reading about.